Sonia Nazario doesn’t just write. Sure, she was the youngest person the Wall Street Journal ever hired. She also landed that coveted writing gig fresh out of college. As an investigative journalist, she propelled from one vital assignment to the next with her go-getter attitude and a passion for emerging Latin American social issues. Within months at the Wall Street Journal, she leapt from news assistant to reporter. She’d go on to collect award after award for her unadulterated reports too, written with force and literary appeal. Yet Sonia says that when she first started out as a reporter, she couldn’t write. “My editor in Atlanta knew he would have to teach me to write better, but I had a lot of the other skills and innate abilities that would make me a good reporter,” she shared with me. So who says writing is a talent? Not Sonia Nazario. And as a Pulitzer Prize winning journalist, she’d know a thing or two about that. 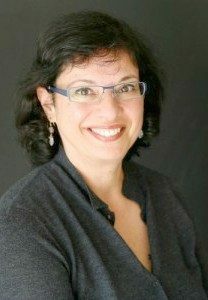 That’s why, in this Q&A, Sonia shares what writers need to know to write well and get published. If you’re worried you don’t write well enough to live out your writing dreams. If you think about writing everyday but believe you weren’t born with “the writing gift,” you won’t want to miss this interview. Reporters, novelists, bloggers—anyone who dreams about writing something that matters—will find what they need to finally push forward right here. All straight from an author who doesn’t just write. She’s made the world a better place through writing. If you know anything about Sonia Nazario, it’s that she hitchhiked and rode atop 7 freight trains through 1600 miles of Mexico and Central America. Her journey took three long months. And she did it twice. That would be harrowing enough for anyone. But it got worse for Sonia. She shared this terror-train journey with the gangs who claimed and ran them, the corrupt cops who stole money from children along the way, and the women and children whom Sonia knew wouldn’t all make it. Why would anyone willingly jump into this kind of horror? If you’re Sonia Nazario, you do it to give voice to the children who flee violence and poverty only to enter the US illegally and alone (an estimated 74, 000 child immigrants entered the US in just 2014). 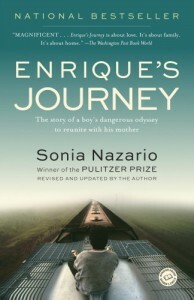 To write the Pulitzer Prize winning series that would become Enrique’s Journey, Sonia retraced the steps of Enrique, a 17-year-old boy from Honduras who faced this violently dangerous trek to find his mother Lourdes in the States. She’d left him behind in Honduras to earn the money that would send Enrique to school past the third grade. “I thought I was walking just up to the line of crazy but never really crossing it” Sonia said during her speech at California State University Bakersfield in October. She changed her mind when a tree branch nearly knocked her from the train on her second trip. The locomotive force would have sucked her into the wheels like so many women and children before her had she fallen. Lucky for the uncounted children she’s helped through Enrique’s Journey, Sonia avoided the fall, survived the trip, and finished the story. Projects this critical take a dedication few can muster. It isn’t just the commitment to a cause. To overcoming innumerable dangers. Even when you hear the call. When you face the challenge. When you’ve hurdled over innumerable obstacles. You still have to shape the story so others hear the call too. You have to tell the story so right that readers dare to engage with the towering, too-big issues that have long since burned them out and buried their hopes. This is the power of Sonia Nazario and her work. And this is what she shares here with you. How she writes so people listen. Ready, writer? Here we go. Here’s what you’ll find in this Q&A with Pulitzer Prize winning journalist, Sonia Nazario. Find out more about her work at Enrique’s Journey.